The provinces in Canada make use of different types of approaches for selecting Express Entry candidates that they can invite for sending applications for getting a provincial nomination for a permanent residence. In the last week, there was a lot of action from three of them in Nova Scotia, Ontario and Prince Edward Island. The Express Entry candidates that receive provincial nomination are also awarded with additional 600 points that is added to their personal Express Entry ranking score. This makes having a nomination the most important factor for obtaining Canadian permanent residence. The nomination can more or less guarantee a person’s chances to apply for a Canadian permanent residence. The Provincial Nominee Program or PNP of Canada allows the participating territories and provinces to nominate a definite figure of economic immigration candidates looking to obtain permanent residence every year. Every territory and province with a PNP consists of at least a single stream for candidates within federal Express Entry system that manages the total pool of candidates meant for the three Federal High Skilled economic immigration programs of Canada, namely the Federal Skilled Worker Class, the Canadian Experience Class and the Federal Skilled Trades Class. In the year 2017, 109,497 Express Entry candidates applied for obtaining Canadian permanent residence. Among them, more than 17,000 candidates had provincial nomination. This was a major increase from the figures in 2016 that were around 4,000. Getting a provincial nomination is really worth a lot to the Express Entry candidates if they are trying to enhance their CRS or Comprehensive Ranking System score that is normally used for determining the ranking of a candidate in Express Entry pool. 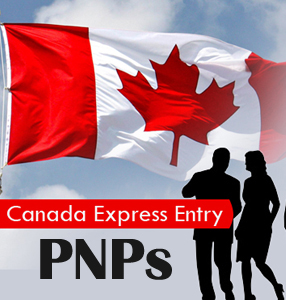 The three active PNP streams observed this week are particularly popular with the Express Entry candidates as they do not generally need a minimum requisite CRS score or Canadian job offer for being eligible. Nova Scotia reopened the Category B of its Demand: Express Entry Stream on Saturday, November 17th that allows all the eligible Express Entry candidates to apply actively for the provincial nomination. The Category B is the last remaining example in Canada of PNP category operating on first-come, first-served basis. In other words, once Category B opens it is going to accept applications from all candidates based on the order in which they are submitted as long as a definite quota is met. This quota is filled rather quickly. November 17th intake occurred in a typical fashion that is characteristic of the highly competitive application process. It reached its specific 225 applications quota in less than a period of 2 hours. For the Express Entry candidates to be regarded as eligible for the Category B, they are not needed to get a Nova Scotia based job offer. However, they must have sufficient work experience in at least one of the 11 opportunity occupations of the province, which is one of the multiple criteria. Prince Edward Island (PEI), the fellow Maritime province of Nova Scotia also invited the Express Entry candidates for a draw that was held on November 15th through its EOI or Expression of Interest system. The system is used for ranking the Express Entry candidates that have expressed interest for the provincial nominee program in PEI, called the PEI PNP, by submitting their profiles to the province. The EOI profiles are incorporated into the PEI’s overall pool of the eligible candidates meant for Express Entry Category. They are categorically ranked based on their scores that are awarded for factors like education, proficiency in French or English and work experience. PEI then chooses the candidates via monthly draws from such pools. Ever since PEI PNP switched to EOI system in the month of February, it has carried out 10 such draws. PEI is one among four provinces which use an EOI system for managing its PNP candidates. The other provinces include Manitoba, British Columbia and Saskatchewan. The EOI systems are used for managing federal Express Entry pool. The candidates mainly focus on the Quebec Skilled Worker Program. Another major Express Entry-linked PNP pathway issuing invitations to candidates for applying for provincial nomination over the last week was one among Ontario’s 3 passive Express Entry streams. The streams in Ontario, namely Human Capital Priorities Stream, the Skilled Trades Stream, the French-Speaking Skilled Worker Stream are considered to be passive as the Express Entry candidates are not able to actively declare their interest or send an application to be considered for nomination through them. These streams instead allow Ontario Immigrant Nominee Program or OINP to search federal Express Entry pool to find candidates that match their specific eligibility requirements and then invite them for applying for provincial nomination. OINP depends heavily on the Express Entry-linked streams that together make up for about 95% of the total 6,600 nominations that have been issued this year by Ontario. The Human Capital Priorities Stream accounted for a total of 3,534 nominations which was followed by French-Speaking Skilled Worker Stream at about 1,476 and Skilled Trades Stream at around 1,445. The French-Speaking Skilled Worker Stream saw a lot of new invitations being issued last week. For quite some time, this stream has been offering invitations on per week basis for the Express Entry candidates that meet their English and French language proficiency criteria. It is important to submit an Express Entry profile for being considered by the OINP streams discussed above. However it is only the first of the many steps involved. The Express Entry system and Provincial Nominee Program of Canada are destined to play an increasingly high-profile role in Canadian immigration strategy for the years between 2018 and 2021. The total combined admissions for Canada’s PNP and Express Entry-managed programs are projected to give rise to around 142,400 new permanent residents within 2019. This figure represents about 43% of Canada’s target of total new admissions of 330,800 to Canada by next year. The numbers of people becoming new permanent residents in Canada through the Express Entry-linked PNPs have gone through major boost in the recent years. The figures in fact rose from 7818 to 13528 between 2016 and 2017. This shows an increase of around 73%, according to the statistics presented by Immigration, Refugees and Citizenship Canada. With the growing importance of Canadian immigration, it is safe to say that innovative approaches will be adopted in the future for selecting the Express Entry candidates through the Canadian PNP streams.